Standing high above central Lisbon on the hill of Santo André, the viewpoint at Graça is an elegant terrace located next to an ancient church in one of the city’s oldest and most intriguing districts. It has far-reaching vistas across to St George’s Castle (Castello de São Jorge) and down to the River Tagus, with panorama spreading out below encompassing the rooftops of Alfama and Mouraria as well as the rust-red spans of the 25th of April Bridge (Ponte 25 de Abril). The mirador is officially known as the Miradouro Sophia de Mello Breyner Andresen in honor of a local poet who spent her days admiring the views and writing here. There is no better time to visit than at dusk, when the open-air Café Do Monte at the viewpoint becomes the gathering point of locals and visitors alike to watch the sun slipping down as lights begin to twinkle all over the city. The site is open 24 hours a day. Walk from Alfama, or take the tourist Tram 28 or buses 712 or 726 to Sapadores. Delve into the colorful world of street art in Lisbon on this private tour. It'll help you discover hidden artwork down alleyways and narrow streets that you wouldn’t find alone. As you tour the city, your guide will enhance your experience by telling you about the meaning behind the artwork, and the different techniques used. As it’s a private tour, you can customize your experience based on your interests, making it the perfect tour, just for you. A perfect way to visit Lisbon in a luxury car on a single day ( Full Day and Half Day Options)Lisbon is one of the most cosmopolitan cities and one of the main cultural centres in Europe. 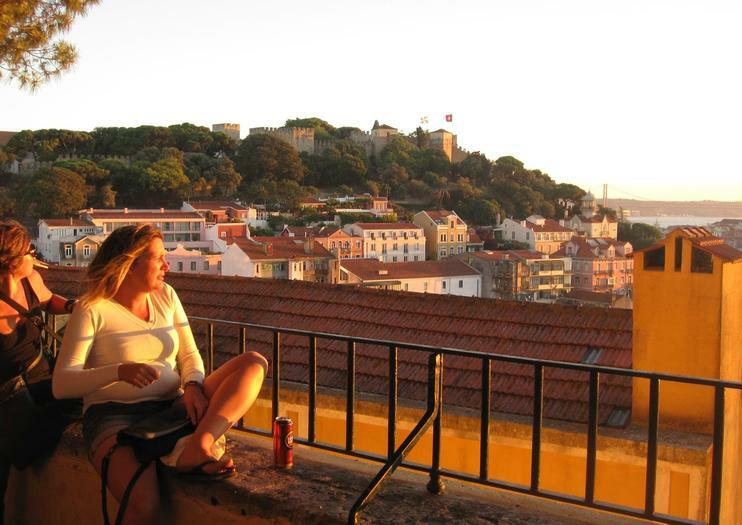 You will enjoy viewpoints of Lisbon on its different hills. Narrow streets filled with unique architecture. The tile and the typical pavement that surround the noble and oldest areas of the city like "Alfama". The monuments that fill the city with the history of the old world, the Portuguese art of navigation and the discoveries.The Tagus river that surrounds the area of Belém, where you can find the monuments that mark the history of the country. The monument of the discoveries, the Tower of Belém and the most famous Monastery of Portugal, the St. Jerome Monastery considered World Heritage of Unesco. Have the opportunity to enjoy this trip aboard a Luxury vehicle with an experienced driver and local guide. Passing through the downtown area of Lisbon, you will learn about the earthquake of 1755 and how that changed the city forever. See Rossio, the heart of the city center and head to the top of one of the city’s hills: Graça. Here you can enjoy the breathtaking views overlooking the city and the river. You will then explore the most authentic neighborhood of Lisbon: Alfama. You will fall in love with its narrow maze-like streets and feel like you are suddenly in a small village.It is time to visit another neighborhood: Belém. Here you will have the chance to see the impressive Jerónimos Monastery, the resting place of kings, queens and the famous navigator Vasco da Gama and poet Camões. After the Monastery it is time to go to the Belém Tower, a fortress built by order of King Manuel I in order to protect the banks of Lisbon in the 16th century. Before returning to the hotel, enjoy a delicious Belém pastry. Combine an atmospheric tramcar ride through Lisbon’s historic neighborhoods with a traditional Fado show on this great-value combo tour. Maximise your time in the city with a hop-on hop-off tramcar tour, visiting the hilltop neighborhoods of Alfama, Castelo and Bairro Alto, St George's Castle, and Lisbon Cathedral, then enjoy an evening of live Portuguese folk music. The beauty of Lisbon can be difficult to capture, but this private walking tour with a photographer guide can help. Follow your guide to some of the city's most picturesque streets, plazas, and viewpoints and get insight from a pro on how to frame the perfect shot. Between destinations, learn about Lisbon as you walk past popular sights in the Graça, Mouraria, and Alfama neighborhoods. Explore Lisbon’s oldest neighborhood on this private 3-hour tour of the Alfama district. Admire the medieval architecture and old taverns of Alfama; pass landmarks such as São Jorge’s Castle; and enjoy spectacular views over Lisbon. Uncover the best of Lisbon like a Lisbonite on this relaxed yet informative small-group walking tour. Your local guide will take you through numerous popular neighborhoods, such as Bairro Alto and Graça, providing historical context for the sights—which often include the Elevador da Bica, Igreja de São Roque, and Miradouro da Santa Catarina—you’ll pass along the way. The Lisbon tour, is one way of showing Lisbon at is glory, history and glamour. This private tours are designed to be more flexible so they can be adapted and customized in order to meet your needs and interests, along with our suggestions will result in an itinerary tailored to suit you. Yellow Cab TT Tours is always at your disposal with the quality you have come to expect. If you want to have a wonderful introduction to Lisbon, this is the perfect Tour for you.Our tour will start taking you around the downtown area of Lisbon, the romantic neighborhoods that were the meeting point of poets and artists called Baixa and Chiado. We'll learn about the rich Portuguese culture, the longest dictatorship in Europe and the Revolution that put an end to it, histories involving Portugal during WW II and much more.​From there we’ll visit Alfama, the oldest neighborhood in Lisbon, with its influence of many cultures that lived here throughout time. From the shores of the Tagus River up to the Castle, we’ll see the charming narrow streets, the famous “azulejos” on the walls, the clothes on the balconies, the incredible view points, the iconic trams and learn a bit about the Soul of the Portuguese culture, Fado.​We’ll take you to places like Santa Justa Elevator, São Jorge Castle, Portas do Sol, Rossio Square, Sé Cathedral, Casa do Alentejo and many more. Discover Lisbon, one of the most cosmopolitan cities and one of the main cultural centres in Europe. Get through its museums, architecture, monuments and typical gastronomy. Find historical sights and magical places with breath taking views. Visit one of the most remarkable historical monuments of Portugal world heritage considered by UNESCO, the Jerónimos (Hieronymite) Monastery.Enjoy the typical sidewalk and tile through narrow and picturesque streets at one of the oldest neighborhoods in Lisbon, Alfama. En este tour recorreremos las colinas de Lisboa, visitando los miradores más famosos de la ciudad, desde donde podremos ver y sacar unas magníficas fotos del río y de los principales monumentos y plazas de Lisboa.Comenzamos por la colina de S. Jorge, donde se encuentra el castillo, desde allí nos dirigimos al mirador de Santa Lucia y las Portas do Sol, para tener una preciosa vista del barrio de Alfama. Subimos hasta Graça, donde su alto mirador nos regala una de las mejores postales de la ciudad y el castillo. Caminaremos hasta el famoso Barrio Alto, para llegar al mirador de Santa Catarina y el de S. Pedro de Alcántara, arriba del todo. En cada mirador pararemos, para deleitarnos con las vistas y sacar fotos espectaculares, y por supuesto la guía nos irá orientando y contando interesantes historias, convirtiendo el tour en una magnífica visita panorámica de Lisboa, ideal tanto si acabas de llegar a Lisboa como si ya conoces la ciudad.